NEC PC-Engine CD-ROM published 25 years ago by Hudson Soft. 超英雄伝説ダイナスティックヒーロー © 1994 Hudson Soft. Dynastic Hero is a side scrolling action/adventure game by Hudson Soft and is the PC-Engine port of Wonder Boy V Monster World III. The player character and protagonist of the game, Dyna, is a young boy who embarks on a long journey to save the world from the monsters that seek to destroy it. No one in the country knows where they come from and who controls them. Dyna starts his journey with a short sword and his first task is to expand his arsenal of weapons and fighting techniques. The sword is good for close combat and allows him to hold a shield at the same time whereas the spear comes with a greater range but prevents him to use the shield. Our hero can also find magic spells scattered all over the visited worlds. There is a grand total of six magic spells including the powerful Earthquake or the Thunder Fireballs. Spells, and also items, can be assigned to the directional pad and activated by pressing the Run button. Wonder Boy 5 offers a fair deal of adventure and discussions with villagers often give Dyna precious clues and help him take his next step - such information can help him enter nearby dungeons and to defeat the fierce bosses within their walls. The game's progress can be saved inside the numerous Inns that adorn each town. Dynastic Hero was released on May 20, 1994 in Japan for 6800 Yen. Wonder Boy V Monster World III was originally released for the Sega Mega Drive in 1991 and known in both Europe and North America as "Wonder Boy in Monster World". Hudson Soft finally completed the PC-Engine port three years later and felt free to modify some of the game's original character design. 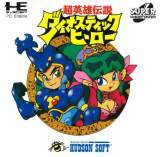 Hudson Soft slightly redesigned the main characters and made them live in an insectoid world. The game's protagonist now wears a beetle shaped armor and the various bosses are now batrachians and lizards. The game's soundtracks is also completely different and offers CD quality audio. Finally, and sadly, the PC-Engine version lost the nice parallax scrolling.